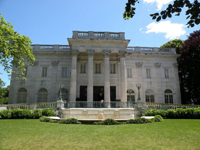 Newport Mansions - Experience the opulence of these amazing "summer cottages"
Bellevue Avenue, my life was nothing like the elites who spent their summers in those "cottages" during Newport's Gilded Age. It's crazy to imagine, once you've seen these mansions, that people actually lived there! They must've gotten lost all the time. Or maybe they had servants in every room to guide them if they weren't sure where to go. I can't remember for sure which mansion I saw first. It was probably The Breakers (pictured below). I do remember my grandmother bringing me and a couple of my cousins to tour them during the summer. Although I appreciate the architecture and history alot more now, I still enjoyed seeing these colossal homes as a child. We had fun and took many pictures. If I can ever find any of them I'll get them up on the site. Newport Rhode Island was the summer playground of America's wealthiest families, including the Vanderbilts, the Astors and the Morgans. During the 19th Century, America's elite summered here, usually for only six weeks. They raced their yachts in Narragansett Bay, relaxed at Bailey's Beach, played tennis at the Newport Casino (the current site of the International Tennis Hall of Fame) on Bellevue Avenue, and hosted extravagant parties at their homes at night. Not a bad life, huh? 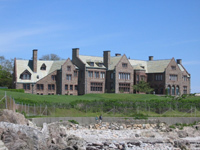 Some of the Newport Mansions are open on weekends throughout the year. The Breakers is open daily, year-round. Others only on special occasions. During the summer, they're open daily, but they can be busy. Be prepared to wait a half an hour or so. It's well worth it. There are also some great package deals that you can take advantage of. 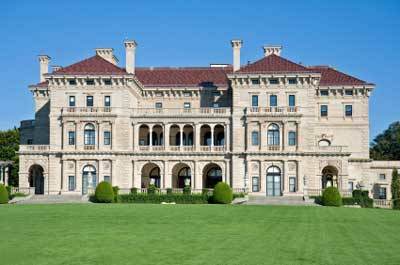 From May 16th through October 12th, the Newport Mansions Premium Tour allows you to see the three most popular mansions (The Breakers, Marble House and The Elms). You also get a Behind the Scenes Tour at The Elms, and you can have lunch at The Elms Carriage House Cafe. You can tour the Newport mansions in any order you wish, and you can spread them out on different days. This is a great deal at $49 for adults and $19 for children. Visit the Preservation Society of Newport County's website to purchase tickets in advance, or you can just buy them when you get there. 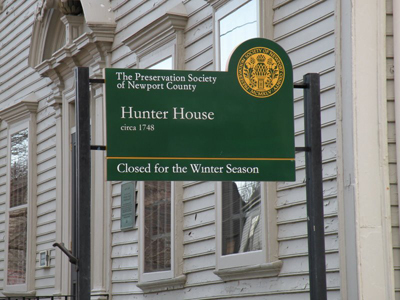 In addition, if you think you may be interested in attending any of the lectures or special events held at any of the Newport mansions, it might make more sense for you to become a member of the Preservation Society of Newport County. You'll save a lot of money that way. 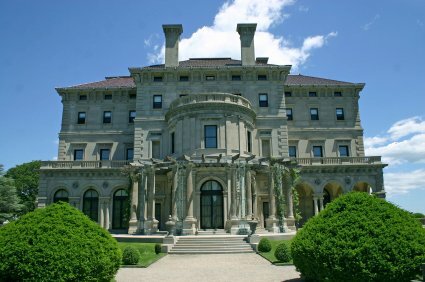 The Breakers Mansion is my favorite of all the Newport Rhode Island mansions. Designed by Richard Morris Hunt for Cornelius Vanderbilt II, President and Chairman of the New York Central Railroad. Open daily, except on Thanksgiving and Christmas. 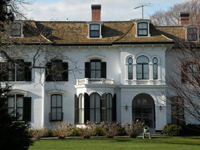 The Elms mansion was the summer residence of Mr. and Mrs. Edward Julius Berwind of Philadelphia and New York. The Elms was built in 1901 for approximately $1.4 million. It was modeled after the French chateau d'Asnieres outside Paris. Beautiful terraces, sunken garden and Venetian paintings. 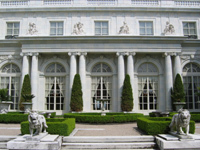 This Vanderbilt mansion used 500,000 cubic feet of marble in its construction. The marble accounted for more than half of the cost of the home! 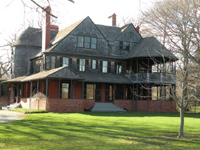 It was the "Summer cottage" of Mr. and Mrs. William K. Vanderbilt. You can see the Chinese Tea House on its back lawn from the Cliff Walk. Completed in 1902 (for 2.5 million dollars), Rosecliff was home to Nevada silver heiress Theresa Fair Oelrichs. You may recognize it from films such as The Great Gatsby, True Lies (the ballroom dance scene was filmed here) and Amistad. This is a great location to hold a wedding reception or corporate event. Originally built by Frederick W. Vanderbilt, Rough Point is more well known as the home of tobacco heiress Doris Duke (Duke University). Duke was responsible for a great deal of Newport's architectural preservation by founding the Newport Restoration Foundation, which runs the property today. 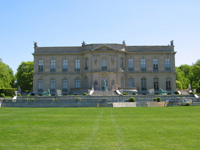 The second largest of the Newport mansions. Summer home of banker and developer, Ogden Goelet. Given as a gift by their son, Robert, to the Religious Sisters of Mercy in 1947. 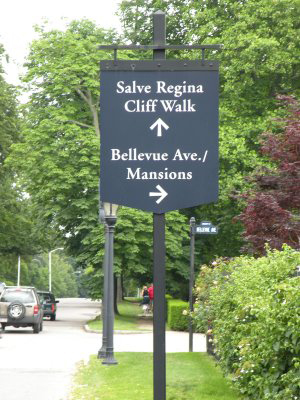 Originally housed the entire Salve Regina University, it now houses the school's administrative offices. As the name implies, this was the home of Isaac Bell, a wealthy cotton broker and investor. There's an interesting mix of styles in this shingled structure. English, European, Colonial American and Japanese all blend together. One of many properties owned by the Preservation Society of Newport County. The summer home of Edmund Schermerhorn, Chepstow was built in 1860 by Newport architect George Champlin Mason. Bought by Mrs. Emily Morris Gallatin in 1911, it still contains many furnishings and documents from the Morris family. This property requires advance reservations for tours. 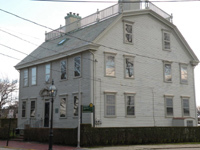 This colonial home was owned by both Jonathon Nichols, Jr. (wealthy merchant) and Colonel Joseph Wanton, Jr. (Deputy Governor of Rhode Island). It was built between 1748 and 1754. Later owned by William Hunter (U.S. Senator). Now one of many National Historic Landmarks in Newport. As you can see, there are a variety of Newport mansions to enjoy during your visit. Some are colossal, opulent palaces, and others are smaller, more modest homes. You are sure to learn a great deal about "America's 1st Resort", the awe-inspiring Newport mansions and the people who played here during America's Gilded Age. 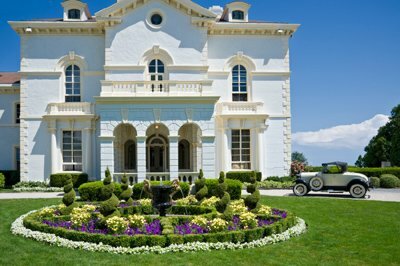 Once you do learn a little about them, feel free to take our Newport Mansions Quiz to test your knowledge!